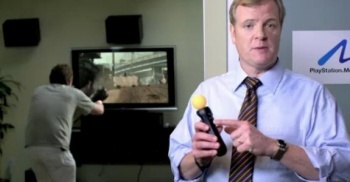 As part of the settlement, Kevin Butler actor Jerry Lambert agrees not to appear in any ads featuring PlayStation competitors for at least two years. When Kevin Butler actor Jerry Lambert appeared in a Bridgestone tire ad holding a rival console in his mitts - even though he wasn't portraying Kevin Butler at the time - Sony became somewhat miffed. So miffed that it sued, and that suit has now settled, with Sony standing astride Lambert like something out of Frazetta. Under the terms of the settlement, Lambert agrees not to appear in any ad or promotion featuring, or mentioning in any way, any other videogame, game system, or game company. This embargo will last for a period of two years. While Lambert can be in the same frame as a game after the two years are up, he still has to give Sony adequate notice, and provide enough information for Sony to decide whether or not Lambert's performance violates Sony's Butler rights. This will go on for a further two years after the embargo has lifted, so Lambert's essentially in videogame limbo for the next four years altogether. Meanwhile Bridgestone, the tire company that started it all, is still fighting it out with Sony. Good luck, Bridgestone; you may need it.